When will I get my order? : Orders are processed in 4 business days. Then refer to this map (Click here for map) to calculate the additional shipping time. Your favors ship from NC. Looking for the perfect graduation centerpiece? These fun lollipop graduation table centerpieces also can serve as your favors. This means your guests will be extra enthused, as they each can take a lollipop home. Each graduation party table centerpiece comes with 17 lollipops, which are individually wrapped in a clear cello bag. There are a variety of handcrafted lollipops in yummy flavors which include cotton candy, cherry, marshmallow, watermelon and lemon. The center custom lollipop shown will be substituted with a non-personalized one. 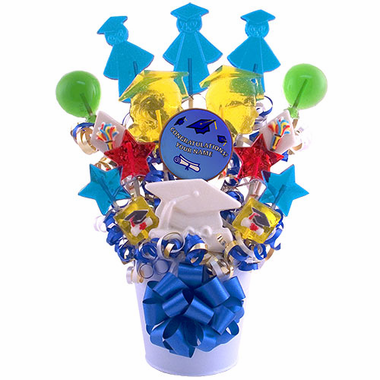 IMPORTANT: While many customers use this lollipop bouquet as graduation party table centerpieces, there is a front and back, and the front is finished and more attractive than the back. Ingredients Hard Candy Nut Free Lollipops: Sugar, Corn Syrup, Natural & Artificial Flavors and Colors. May contain Red 40, Blue 2, FD&C Yellow 5, Citric Acid, Dioxide, Sodium Benzoate. Icing pieces contain egg whites & salt. Chocolate in brown lollipops.